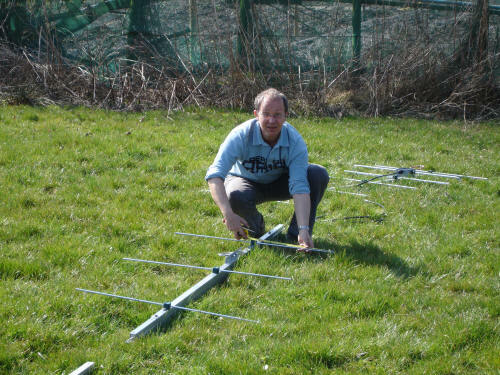 In March 2011 Peter PA3BIY and I started working on a remote 2 mtr station for PA3BIY. We started building an antenna. 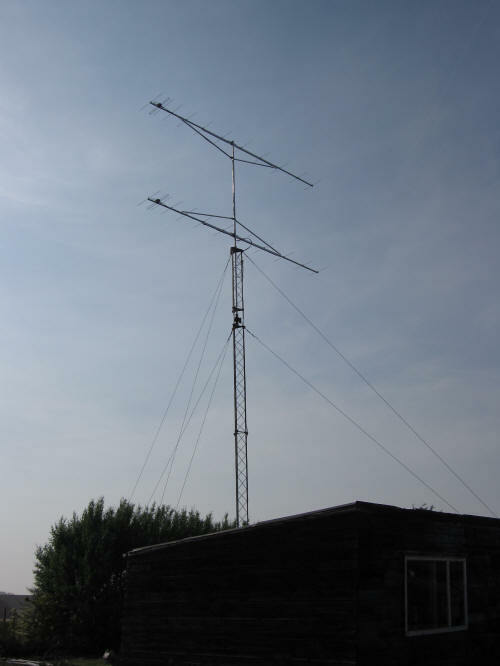 The mast is 12 mtr high and on top a 2 times YU7EF 12 elements yagi spaced 3.5 mtr. 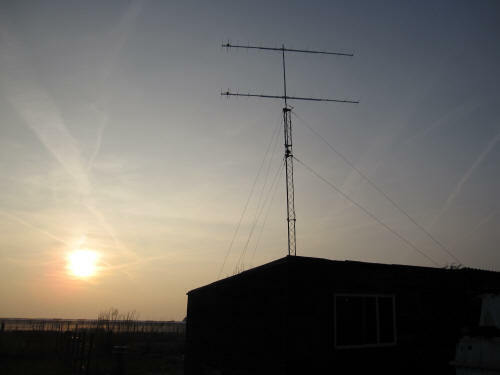 The yagi's were home-made by PA3BIY. 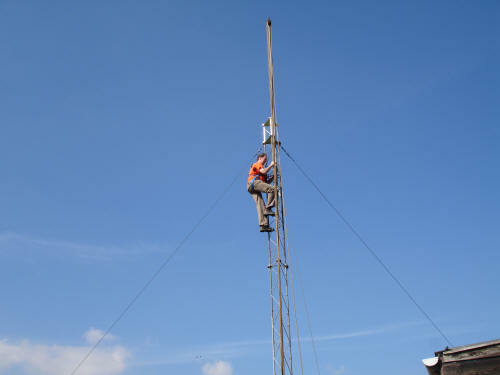 a small help mast is mounted to lift the next segment. The antenna worked fine, excellent VSWR and very fine diagram. After a few days we had strong wind and the front part of the antenna mechanically vibrated very strong. We decided to modify the antenna and attach an extra support to the antenna's This worked fine and even with strong winds we found no further mechanical problems. After this the remote station from Peter was not ready yet, so I decided to put my transceiver Kenwood TS-2000 as temporary remote system. Peter is still working hard to get his home made station running with remote control. During special events we are active from this site without remote control, Peter moves his equipment to this site and we are QRV from here. During Perseids Peter was active from this remote site and made almost 60 MS QSO's. I also was active on 12 august and in the night from 12 to 13 august with Peters equipment and made 30 MS QSO's. In total we worked almost 90 QSO's during Perseids 2011. For my temporary remote equipment I use my Kenwood TS-2000 which is controlled by a small PC. I started the remote control by testing Ham Radio Deluxe installed on the remote PC. Control was possible by using remote PC control using logmein. This performs but working slowly because all graphical data from the remote PC must be transferred to the local PC. It works fine but is in my opinion not the best solution. A better solution in Ham Radio Deluxe is the possibility to connect to the remote PC running Ham Radio Deluxe in server mode. In this mode only the necessary commands for HRD are send via the link and this works much better. At the remote PC the HRD server should be activated. At the local PC we run HRD and connect to the remote HRD server. In this way we get a fast control on the transceiver wich in my opinion brings best performance. More difficult was using HRD server for steering the antenna rotor. Problems I had to solve when using Ham Radio Deluxe. The first problem I had to counter was the RS232 connection between the PC with HRD and my transceiver the Kenwood TS2000. After some frustrations I found that the RS232 cable I was using was wrong. The cable must be a straight cable without twists in the wires. After this I could control the transceiver without problems. Second was the audio from the transceiver to the remote position. First I tried using Skype, this worked but sometimes with small glitches in the audio. Furthermore using Skype gave me a problem with processor capacity from my remote PC. I don't know why Skype demands so much processor capacity but as soon as Skype was used the processor was 100% used and having little time for other tasks. This causing sometimes long delays in the audio. I decided to try other programs for audio transfer to the remote station. During search on internet I found a program called IP-sound which gave good performance with low processor usage (remarkable difference compared to Skype). The next problem was the control of the antenna rotor. The used rotor is a Spid Alpha azimuth rotor. After several experiments I found the option in HRD to install a small program in the tools of HRD called N8VB vCOM. After installation this program creates a virtual comm-port which enables the connection from remote PC to control PC. 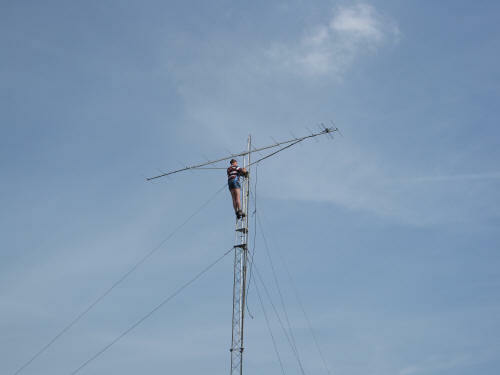 After these problems were solved we tried to really remote control the station from the QH of PA3BIY. Remote control of the TS-2000 was working instantly but transfer of audio with IP-sound was not working as expected. After reading the IP-sound documentation we found that we needed to use a VPN (Virtual Privat Network) for this program. After setup of the VPN the audio was also transferred to PA3BIY at home. Last but not least was an audio problem which still is not fully solved. In the audio transfer we have small glitches and interference. Some of this is caused trough the internet and also by my Wifi lan between my hom,e and the remote site. We are still working to solve this problem. For the time being performance is reasonable. As soon as the remote control from Peters equipment is ready this problem from audio transfer must be solved.